Excelwave Technologies Offers Base Station MIMO Antennas Supporting FirstNet and Cellular LTE Networks. ​EABX-698-960 series antennas are cross polarized dual port antenna with 650 horizontal beamwidth for public safety as well as cellular networks in the frequency range of 698-960MHz, supporting LTE and other MIMO systems. 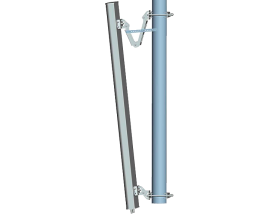 EABV-806-960 series antennas are vertically polarized single port antenna with 650 horizontal beamwidth for public safety as well as cellular networks in the frequency range of 806-960MHz. Operational in wide frequency range, these antennas offer great flexibility for material planning, inventory control as well as cost effective solution for network upgrade and frequency re-banding. With multiband combiners, these antennas can also be used for multiple networks. Please consult sales@excelwavetechnologies.com for custom multiband combiner to support your unique multiple networks. EABX-380-450-G14H65FT covers 380450MHz supporting Tetra, UHF P25 and CDMA450 Networks with cross polarized dual port and 650 horizontal beamwidth. .
EABX-380-450 series antennas are dual cross polarized dual port antenna with 650 horizontal beamwidth for Tetra, UHF P25 well as CDMA450 networks in the frequency range of 380-450MHz. Heavy duty fiberglass radome and ruggedized structure design protect the antenna from harsh environment in mission critical systems.